Jets coach Rex Ryan finally used some brain cells and pulled his franchise quarterback Mark Sanchez who had begun to resemble Bozo the clown. It sometimes feels like Ryan has shed brain cells as well as pounds this season given his knuckleheaded devotion to Sanchez who is quite simply out of his league. Ryan finally figured his future was zero with the Jets with a zero at quarterback and he called on McElroy the former Alabama starter. McElroy finally gave the excitement-starved Jets fan something to cheer for when he led a scoring drive half the length of the field. When McElroy trotted on the field it was the end of the Sanchez era bar the shouting, the hopes of the Franchise ending in typical Jets style with another failure. 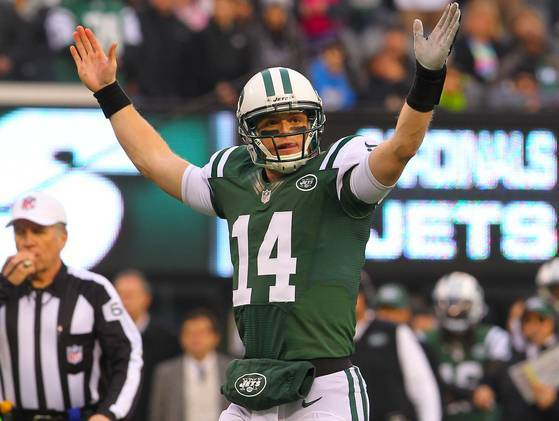 Not since Joe Namath have the Jets had a great quarterback, hell they have hardly had a decent quarterback since. We had the Tim Tebow dog and pony show this year just to distract the Jets further. But now comes McElroy and indeed the victory for the Jets makes him the automatic starter unless Ryan really wants to commit professional suicide. The Jets have finally lost the albatross called Sanchez. Maybe now they can fly with McElroy.